Lake St. Croix Beach was one of the last Washington County river communities to develop. Unlike Afton and Lakeland, the area never attracted loggers or other commercial development. It remained a rural farming community, part of Afton Township. As late as 1886 the town site consisted of two large farms, bisected by the Chicago, Milwaukee & St. Paul railroad and a settler’s road from Afton to Lakeland. Investors began buying up land in the valley in the early 1900s, anticipating the tourism boom. Folks from the Twin Cities, made more mobile by the automobile and desiring to escape the heat and disease of the crowded cities, were looking for recreation opportunities and summer homes. A large chunk of the Lake St. Croix Beach area was purchased by the St. Paul Daily News as a speculative investment. The newspaper offered lots in Lake St. Croix Beach for as little as $67.50 to promote sales of newspaper subscriptions. By the mid-1920s a dense lakefront development of more than 100 blocks had been laid out on the property and a variety of modest cottages built on small lots. These cottages were next to The Anchorage, the elaborate summer home of Stillwater lumberman George H. Atwood, built on a 30-acre site fronting Lake St. Croix. This property was sold in 1908 to the St. Paul Automobile Club which remodeled the premises as a clubhouse. 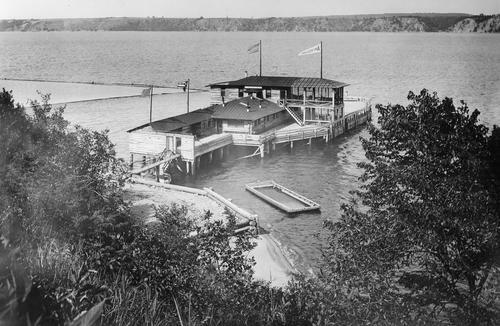 Guests were provided with “advantages for water sports such as motorboating, canoeing, sailing, rowing, fishing, and, of course, bathing.” But the operation was a failure, closing after just four years due to “financial loss, inaccessibility to St. Paul pleasure seekers, and the failure of Washington County to cooperate in the upkeep of roads between St. Paul and Lake St. Croix.” In 1912 the Automobile Club moved to White Bear Lake, which was better served by direct rail and streetcar service from St. Paul, as well as by better roads. In 1914 it was rumored The Anchorage site was being considered by the Ford Motor Company for a factory site, but the factory was eventually built in St. Paul. The Automobile Club building became the Lake St. Croix Beach Property Owners’ Association clubhouse. They used it for many years for dances and also held powerboat races, swimsuit contests, and many more events. Later the building became the center of activities for residents. During the depression, much of the river valley, including Lake St. Croix Beach, remained undeveloped until economic times improved, along with better roads and quicker commutes of summertime residents residing in the Twin Cities. As years passed, the river community experienced slow but steady growth, and many small cabins from the earlier years were turned into year-around homes. The village, incorporated in 1952, became a city in 1974, and in 2000 had a population of 1,140 residents. As with the other river towns, the City of Lake St. Croix Beach is now primarily a bedroom community, mostly residential except for a few businesses along St. Croix Trail South.